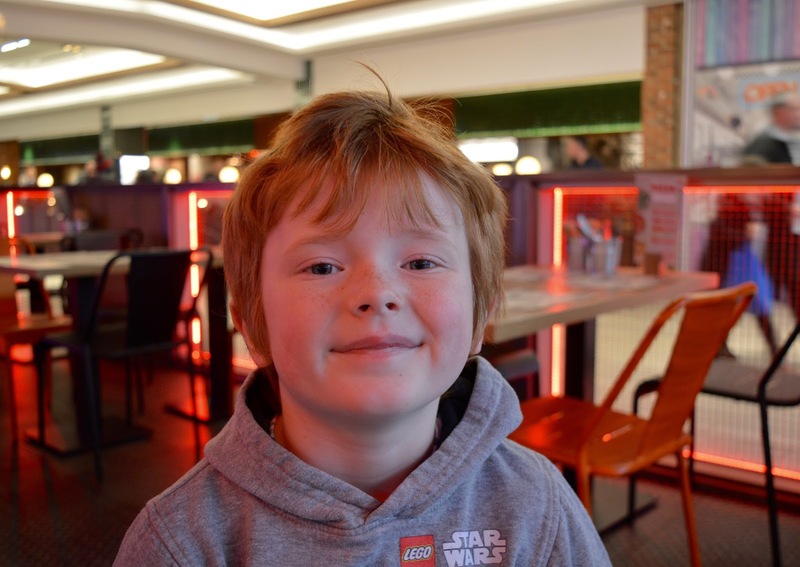 Something I often struggle with when dining with kids in town is finding somewhere for a really quick bite to eat where we don't need to book that will keep them happy and isn't McDonald's. 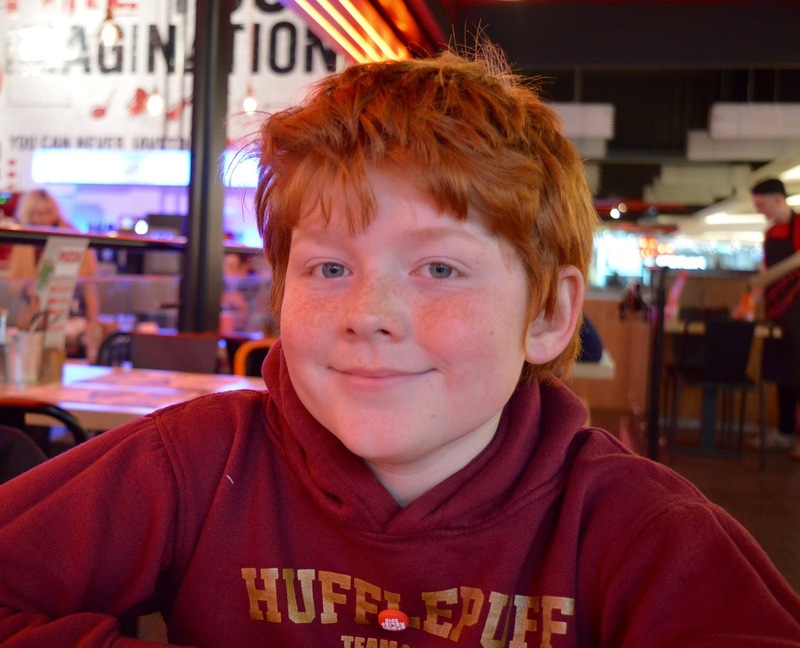 I love a proper meal in a restaurant but often if we're heading into town after school or have tickets to the theatre or cinema, we need something super quick and fuss-free. PizzaStorm recently contacted us and asked if we'd like to try out their pizzas so we decided to put them to the test before a trip to watch an Easter Panto in Newcastle. Our main requirements were that it had to be quick and fill the kids up but still feel like a treat as dining out should. But in reality, it was all good. The queue moved very quickly and the operation is a very slick one. The pricing system is super easy - £5.95 for any pizza with unlimited toppings. Bargain! There's loads of choice too ranging from five types of pizza sauce to five types of cheese and then loads of different veg, meat and fish. You can see the full menu here. I really love that you can have as many toppings and as much as you'd like for one bargain price of £5.95. In comparison, we visited Crepaffaire earlier in the week and the kids wanted to create their own pancake. Every additional topping costs 95p at Crepaffaire so I had to restrict the kids to 3 toppings each (no one wants to pay £10+ for a pancake). 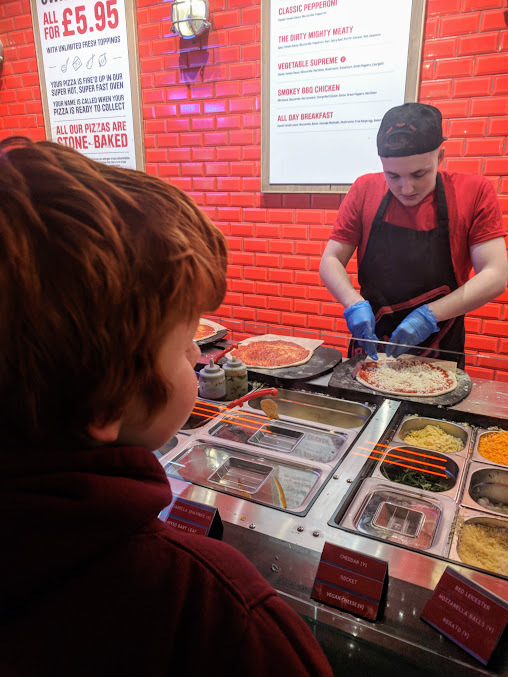 They moaned at me so much for doing this so it was a welcome change at PizzaStorm to let the kids go wild and choose as many toppings as they wanted - they loved having the freedom to do this! 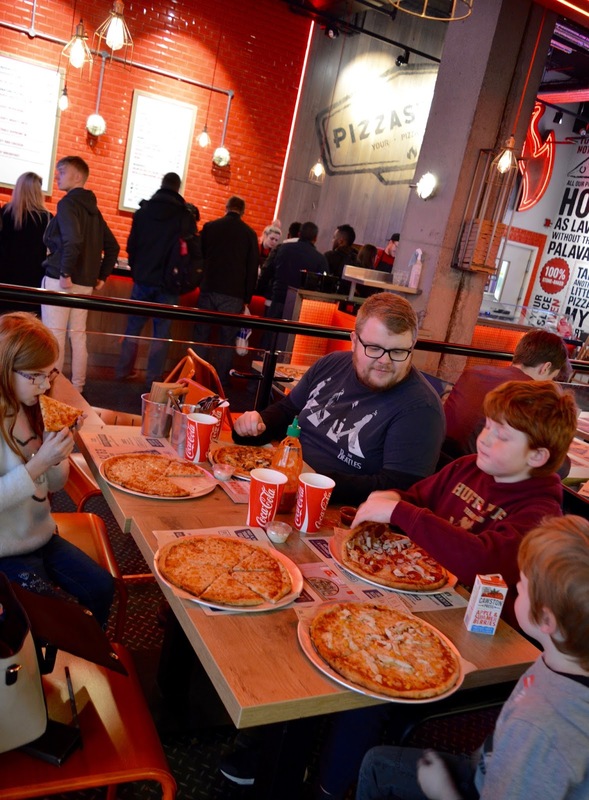 There's no kids menu - all pizzas are the same size (11") but for £5.95, you can't complain at the price. I'm sure the lovely staff would even make a half and half pizza if two younger kids wanted to share. As you move down the toppings station, you simply let the servers know which toppings you'd like. This is a great way to get the kids involved and perfect for fussy eaters - I think when they are in complete control and can see exactly what's going into their meal, they are much more likely to finish what's on their plate and not mess about/complain they don't like it. The final phase is the pizza oven which takes a matter of minutes! We grabbed our drinks and found a table and before we knew it, our name was being called and our pizzas were ready. 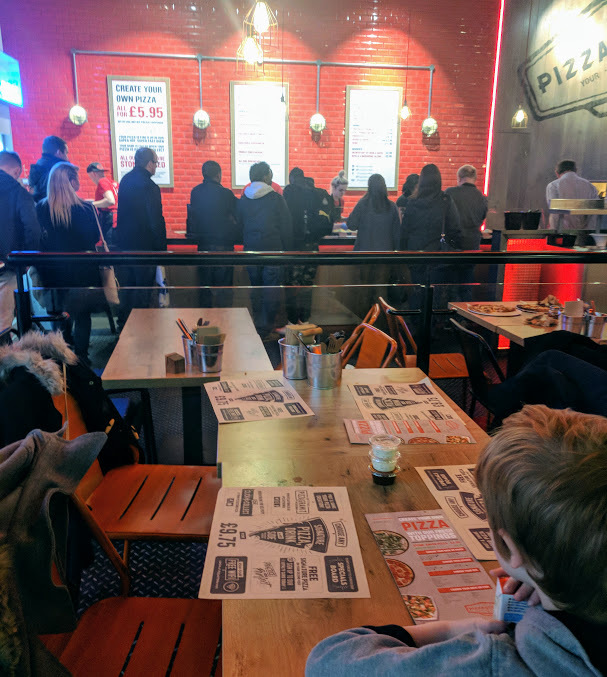 I think the whole process of joining the queue to sitting down and eating our pizzas was around 10 minutes. Not bad at all! Because the pizza was so cheap, I was expecting a huge markup on drinks but unlimited soft drinks will set you back just £1.95 which is cheaper than most places. There's also a meal deal on offer at the moment - choose a pizza with unlimited toppings, unlimited soft drinks and unlimited ice cream for £9.75. This will be perfect for hungry tweens and teens. Heidi and I actually like a simple Margherita pizza over anything else and these can be ordered for £4.50. There's also Mac and Cheese available for £2.95 if you're dining with someone who prefers pasta over pizza. 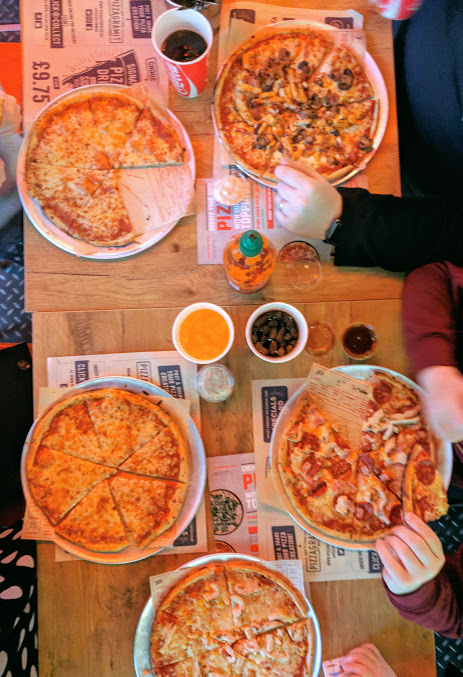 The pizzas from PizzaStorm aren't going to win any awards for being the best pizza in the world but they were perfect for a quick and cheap family tea in town. The bases were crisp (which is Steve's main requirement) and all of us agreed that they were nice and tasty. Jack especially said he loved making his own pizza and wants to come back ASAP. I'd highly recommend the garlic dip for your crusts - it's lush! As we tucked in we were already making plans for our next visit. As well as dining in, you can also create a pizza to take away. 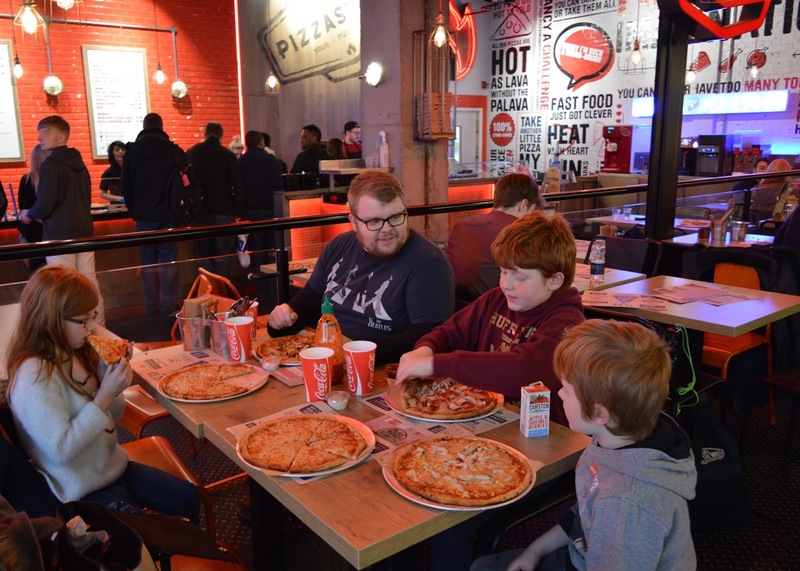 There's also the option to pre-order pizzas online and collect - we're planning on doing this in the summer when NE1's Screen on the Green returns to Old Eldon Square which is just a couple of minutes walk from PizzaStorm. Pizza and an al fresco movie for £5.95 sounds perfect to me! Roll on summer! PizzaStorm certainly fulfilled our brief. We all left feeling full and happy and service was super quick and speedy. I think it could be the cheapest place to dine in Eldon Square's Grey Quarter too and certainly won't break the bank. 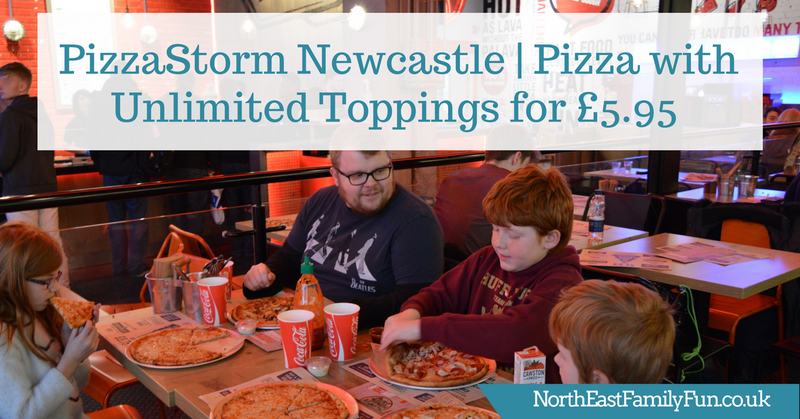 You can find out more about PizzaStorm Newcastle here. 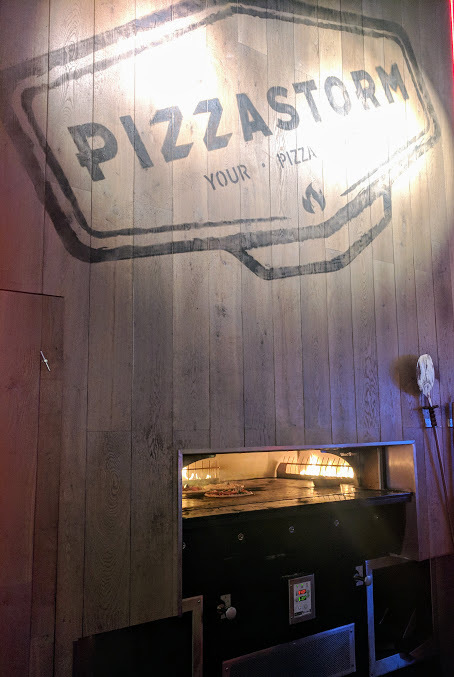 Have you tried PizzaStorm yet? Let me know if you'd try any weird flavour combinations. It's Simon's favourite place to suggest when we want to pick up something quick when we're in town! I'm a fan of their salad pots, although usually I end up choosing pizza because I can never resist!